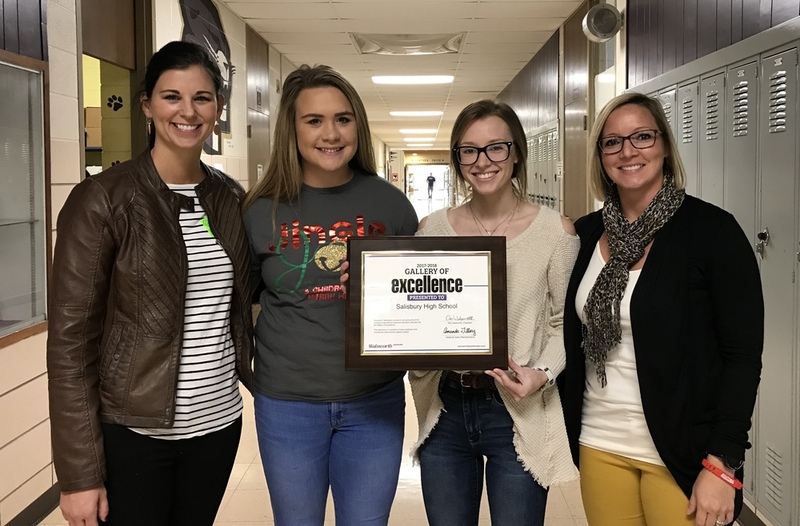 On November 6, yearbook staff members from the 2017-18 SHS SAPAN were presented with the Gallery of Excellence award. The SAPAN was nominated for this award by Walsworth sales representative, Amanda Tillery. The Gallery of Excellence award is voted on by Walsworth’s yearbook division and is awarded to a select few yearbooks that show excellence in design, photography, and copy. Being voted into the Gallery of Excellence means the 2017-18 SAPAN will be shared with other schools around the country, have the possibility to be displayed at journalism events and workshops, and be a part of Walsworth’s promotional materials and idea generators. Congratulations to the 2017-18 yearbook staff for receiving this award. 2017-18 yearbook staff members: Tristen Taylor, Torre Taylor, Chloe Parker, Jill Collier, M’Kenzie Sears, and Amanda Nejedly. Pictured: Walsworth Sales Representative, Amanda Tillery, Amanda Nejedly, M’Kenzie Sears, and yearbook advisor, Stephanie Gladbach.